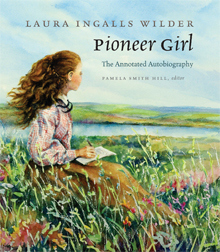 I spent a good part of January reading Laura Ingalls Wilder’s autobiography Pioneer Girl, which has been annotated by editor Pamela Smith Hill. Wilder wrote this autobiography first, and when she and her daughter could not find a publisher for it, it became the source material for the entire Little House series. For me, the annotations made the book. They provide a wealth of historical context as well as insight into Wilder’s writing process (not to mention some literary theft by Wilder’s daughter Rose Wilder Lane). It was fascinating to compare this original recounting of her life with the narrative of the fictional Ingalls family that was eventually published, complete with explanations about how Wilder and Lane shaped the story to better fit the mythology of the American pioneer family. Ostlere explores the nature of grief and loss as she recounts the year following her brother David’s disappearance while sailing with his girlfriend Sarah between Ireland and Madeira. I completely agree with the assessment of the friend who recommended it to me: well-crafted and heartbreaking. I also highly recommend Ostlere’s verse novel for young adults, Karma. In this “modern, sophisticated suspense novel” (to quote the book jacket), Cadence Sinclair Eastman is desperate to remember what happened the summer she was fifteen, when she suffered a head injury during a mysterious accident on Beechwood Island, where her family spends the summers. I wasn’t sure about the ending at first – which one person in my book club astutely described as a Holy F*** ending – but the fact that I’m still thinking about this books weeks later is a sign that it works. Lockhart’s The Disreputable History of Frankie Landau Banks is also well worth a read. This gorgeous, spare book of poetry was like a balm for a bruised soul. (I didn’t even know I had a bruised soul.) It was one of those books I devoured and then was sorry it was finished. Since I can’t quite bear to put this book away on the shelf, I suspect it will sit on my bedside table – so I can dip into it now and again – for quite some time. My friend Kristilyn is hosting the How Canadian Are You? 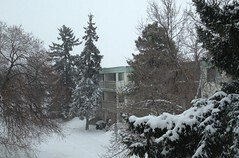 – The 2015 Ultimate Canadian Reading Challenge over on her blog Reading in Winter. 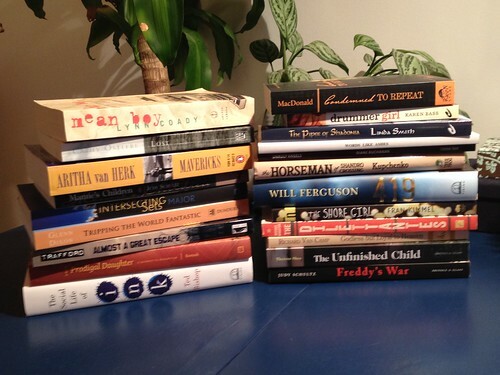 I am going to participate in the “Local Lover Canadian Challenge” and read 20 books by Alberta authors this coming year – in large part because I discovered that I already own more than 20 books by Alberta writers that I haven’t read yet (as evidenced by the photo above). Thinking about Kristilyn’s challenge made me look at my shelves and all of the books I have purchased over the years and not read. Part of it is an occupational hazard: when I worked at the library it was easy to bring books home with me, and I always ended up reading the library books first because they were “due” and other people were waiting to read them. I told myself that I could read the books I own anytime. But that didn’t stop me from buying books (possibly another occupational hazard) and now I own an entire bookcase of books I haven’t read yet. There is a Japanese word for this particular vice: Tsundoku. I’ve decided to create my own reading challenge for 2015, one designed to get me reading the books off my own shelf, to make a dent (if only a small one) in my own reading pile. Starting with the letters A and B in January, I am going to read books by authors whose names begin with each month’s designated letters (hint: February will be C and D). I will post an update on both challenges here each month, to keep myself on track. Although I am doing this for myself, you are welcome to play along if you like in the comments. Do you set reading goals/challenges for yourself? What are they? For eight years, I drove 45 km each way to work. The commute took about 45 minutes, morning and night, if the weather and traffic were both good. On days like today, it took longer. Today’s heavy snowfall has made me think about that drive. How grateful I am not to be doing it. Except, most of the time, I actually enjoyed it. It was, in large part, a highway commute, and I enjoyed watching the fields change with the seasons as I drove north on Highway 21 into Fort Saskatchewan each day. The drive gave me much needed quiet time. Time to pause, to think, to reflect. I did some of my best problem solving during that drive, while my conscious mind focused on the road before me and my unconscious mind turned things over in the background. I was reminded of this phenomena last week while driving out to the farm, when several pieces of my current project fell – rather unexpectedly – into place. I spent the first 30 minutes when I got there madly scribbling notes so I wouldn’t forget anything. I also used to listen to audio books while I drove. I laughed my way through John Green’s Paper Towns. Hilary Mantel’s Wolf Hall kept me going for weeks, and Thomas Cromwell’s problems made my own seem much more manageable. (After all, no matter what happened, at least I didn’t need to worry about losing my head.) I was furious at Barbara Kingsolver when she bragged about growing her own watermelons in Animal, Vegetable, Mineral: A Year of Food Life while I drove through the dark mornings and afternoons of an Alberta February. But I forgave her when I listened to The Lacuna, which I loved. In fact, audio books helped me keep up with reading – my first love in life, and the one that led me to both writing and librarianship – during some of the busiest times of my career. Even so, I am glad not to be on the roads today, and I am incredibly thankful for this sabbatical – it has proven to be an amazing experience (and it’s not over yet). Drive safe everyone. I’m thinking of you. 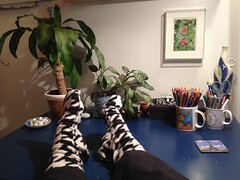 Earlier this summer I discovered Shawna Lemay’s blog Calm Things and have enjoyed reading along as she weaves poetry and photography into her daily life. Today’s post takes its inspiration from her writing there, and also from Paulette Dubé’s poetry. 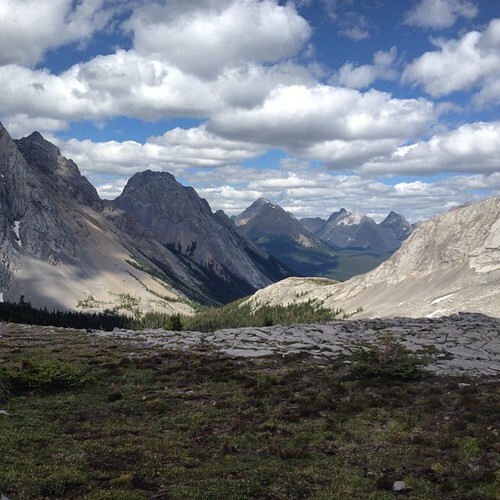 Two weeks ago my sister and I hiked Burstall Pass near Kananaskis. We had that same experience, of being “spit out” by the trail, twice that day. The first was less than an hour in, when we crossed a small creek and found ourselves on the gravel flats. It was like being at the bottom of a bowl made of mountains. The surrounding peaks made for a gorgeous pot, which we admired as we navigated the rivulets of melt-water flowing down from the glacier, with the sound of gravel crunching beneath our boots. 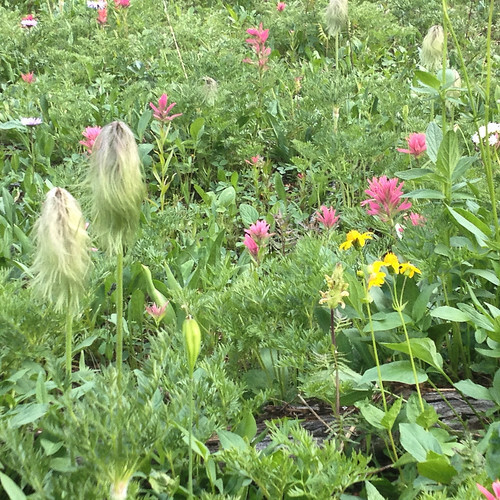 The second was after a steep climb, just when I (the more out-of-shape sister) needed a break and we turned a corner into an alpine meadow in full bloom. Dymphny Dronyk and I had the privilege of including some of Dubé’s poems in an anthology of Alberta poetry, Home and Away (House of Blue Skies, 2009). 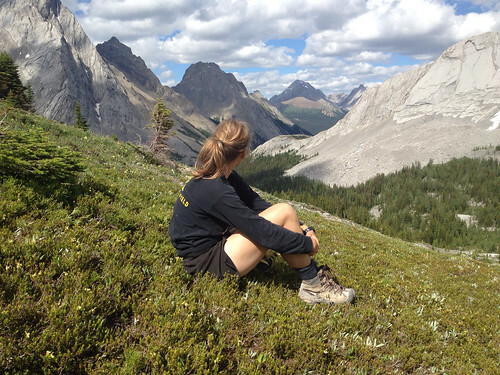 In her introduction to her own work, Dubé recalls that “in five years, I logged 5,000 km out on the trails in Jasper National Park. (I know it sounds incredible, but my husband did the math and I trust him.) I would walk for one or two hours, then I would come home and write for an hour” (54). Her intimate knowledge of the landscape she writes about makes her a sensitive and lyrical guide, and I am so pleased to have found her work. I’d like to share one more poem of Dubé’s, from First Mountain. This poem is selected for my sister, who is a geologist. If you would like to read more of Paulette Dubé’s poems, click here and here. Thank you for reading. I love it when people stop by to say hi in the comments. All kind and thoughtful comments are welcome.